Quick Poll??‍??‍♂️??‍♂️???? : Who enjoys going to the grocery store? Am I the only one that actually likes roaming the aisles of the grocery store? There's just something about finding new ingredients, sifting through the produce to find the perfect tomato, and eating all those samples that I find relaxing. Grant it, I mostly go to the store on a weekday during the middle of work, don't you dare try to make me go on a Sunday? ?, but still there's just something about it. I go to the store weekly, one because it's my only interaction with the outside world, and two I don't like to stock up on stuff for the sake of stocking up. There's nothing more I hate than throwing out food. I'm a planner. I'm also one of those list people. I make a list for everything. I've got a list for work, I've got a list for our upcoming trip, I've got a packing list for my work trip this week, whatever the occasion, I'm making a list. Going to the grocery store isn't any different, it's all there on a handy-dandy, handwritten, list. If you're a handwritten list kind of person, you're going to love me in a minute. I'm about to rock your handwritten-grocery-list world. I've tried all the apps, notes, etc. so don't try to sway me that I'm doing it all wrong. There's something about scratching things off one by one that gives me serious satisfaction. I know, it's physiological. Checking a box/highlighting an item digitally just doesn't do it for me. Also, when I'm planning my list, I can't think unless I'm writing. Is anyone else like that? Plus, I'm pretty serious about my lists, there's always a method to my madness! My grocery list is generally divided by store (yes, I go to more than one grocery store–doesn't everyone? ), sometimes even by location of items within the store, and at the bottom I like to include my menu for the week, just in case I forget to write something down, it's my back up plan. Keeping the menu at the bottom is my form of "meal planning". I know, there are some people out there that define meal planning as pre-prepping and pre-making dinner on Sunday for the whole week. No way... that's way too intense, even for me. The only thing I freeze is left-overs, you'll never find my freezer filled with "pre-made" meals. That goes from "planner" to deranged real quick. I always save the bottom half of my list and put it on the fridge so everyone (all two of us) know what's for dinner tonight. I know ☝?... I'm crazy. However, my batty behavior is your gain! I've designed this grocery list printable, and now I can't make a grocery list without using it. I keep a stack of these in my kitchen drawer so I'm always ready to start my list. sidenote: I'm thinking of making these into magnetic notepads. If you'd be interested in something like that, let me know in the comments below! ?? I like to start my new list as I'm unpacking the groceries I just bought. Sometimes as I'm moving stuff around in the fridge/pantry to make space, I'll notice we're low on something, and I need to get it next time. Having this list right there ready to go is a great way to stay organized and always have what you need on hand. I keep the list on the fridge so I can add items as I think of them. I was standing in line at the grocery store the other day and some lady looked over and said: "Wow, that's quite a list." I told her if I didn't do it this way, I'd go crazy. She laughed and said she totally understood. I laughed and asked her about some things she had in her cart, and then we started talking about how we have our go-to items from Trader Joes, how we can't buy Joe Joes without eating the whole box, and how sometimes they just don't have everything you need. It got me thinking about my go-to grocery items. What are some of your weekly/bi-weekly purchases? I honestly have the same 5 to 10 things on my list almost weekly. As much as I like trying new ingredients and exploring new dishes, I'm still quite the creature of habit. I think I know if I get those items, I can pretty much whip up an easy, healthy dinner any night of the week. I have my go-to dinners to go with my go-to list... We eat at least one, if not all of these things every week. Flank &...– Flank steak is great to keep in your fridge/freezer for an easy weeknight meal. It's so versatile. We either have steak and eggs with roasted broccoli and freshly baked biscuits or I serve it with an Asian style marinade and broccolini with brown rice. Then sometimes we serve it up like fajitas or go full on French and do steak-frites with a big salad. Pork Tenderloin or Chops – I'm a huge pork tenderloin fan, and I've shared some of my go-to tenderloin recipes in the past, but recently I've been all about the chops. I typically serve the chops French style with the bone-in, seasoned with herbs de Provence (?? my favorite brand) and roasted potatoes. Rotisserie Chicken – There's nothing better than a rotisserie chicken. I am not a big raw chicken fan, so I normally take a store-bought rotisserie chicken and reheat it to make it a little more tender and piping hot. To keep it from drying out, I brush it with my favorite BBQ sauce or some lemon, herbs, and butter. Adding some kind of sauce keeps the chicken juicy and makes it feel a little more homemade. Salmon – I always keep salmon in the freezer. It's the perfect last-minute meal, and the leftovers are great on a salad the next day. I've been working on an Asian style marinade that I use on salmon, pork, chicken, and beef. I can't wait to share it with you soon, but until then, give this easy toaster-oven salmon a try. Chalupas – These are a weeknight favorite for Meatless Monday or Taco Tuesday. I love pan "frying" fresh corn tortillas, topping them with beans and cheese, let that get all melty in the oven, and then serving them with a big scoop of fresh avocado and pico. Have y'all tried HEB's half corn half flour tortillas? GO GET SOME TODAY. They're literally the best thing I've ever had. 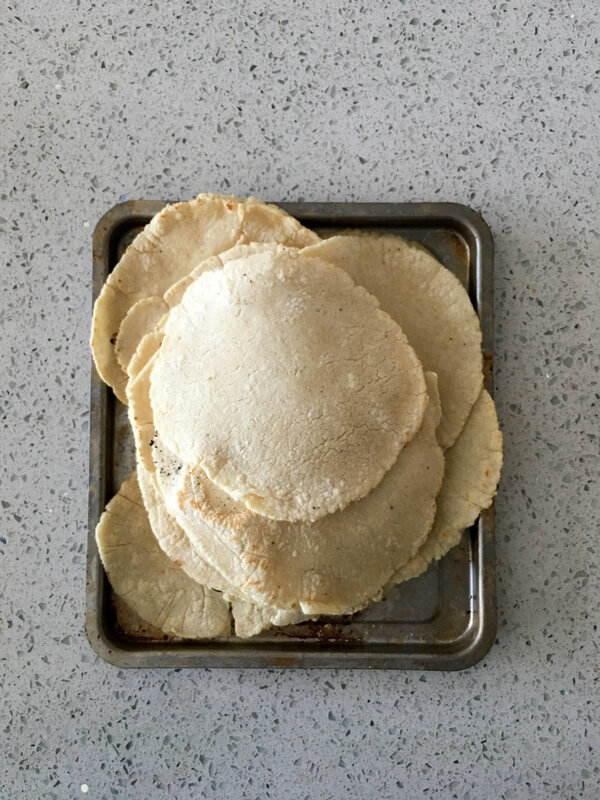 If you don't have HEB, don't worry, give my fresh, scratch corn tortillas a try. What are some of your easy go to meals? Send me a snap, message me on insta or facebook, tweet it at me, or leave a comment below of your favorite go-to meals!